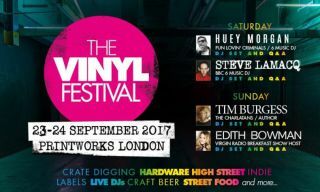 The Vinyl Festival is happening | What Hi-Fi? Printworks London, September 23rd and 24th. We'll see you there? We almost didn't want to say it out loud for fear of jinxing the whole thing, but the first ever Vinyl Festival is taking place. Printworks London is the place, the weekend of September 23rd/24th is the time. Featuring 100 stalls of traders and indie labels, another 48 demonstrating hardware, audio tech developments and vinyl care, and a Vinyl Evaluation area (like Antiques Roadshow but with first pressings of Nick Drake LPs, we're hoping), Vinyl Festival looks set to be the Record Fair par excellence. Music and radio industry figures like Tim Burgess, Huey Morgan, Edith Bowman and Steve Lamacq will be speaking and/or DJing as well as participating in the Vinyl Forum. The Vinyl Festival is working alongside charity partner Music For All, dedicated to providing access to musical instruments to people from all works of life. Tickets to the Festival are available now, starting at £16. Weekend and VIP packages are also available.